When Aaron and I decided to have a small wedding in Italy, we honestly didn't know where to begin. Neither of us had visited Italy before, but we were enchanted by the history, culture, romance, and of course the food! We reached out to Exclusive Italy Weddings and almost immediately received a response from Laura. 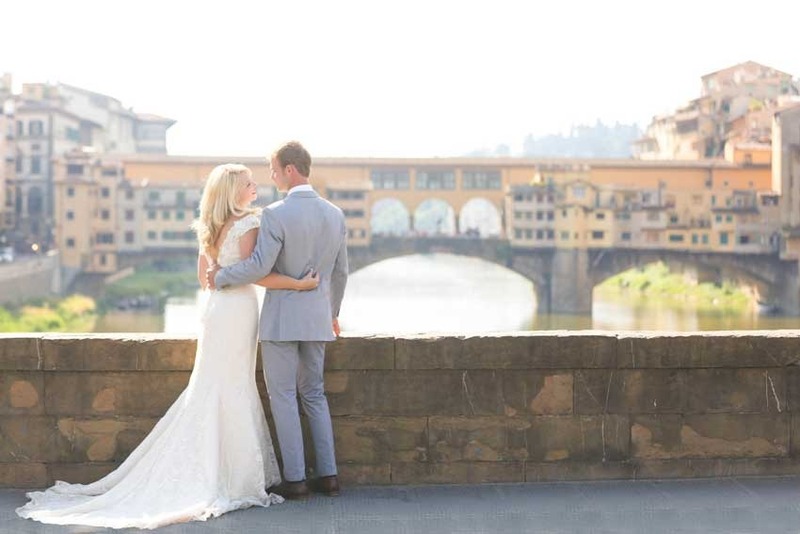 She helped us pick the perfect location (Florence) based off what we were looking for. From there, we worked with Martina who secured everything for us. It was such a relief knowing Martina, Laura and the entire Exclusive Italy team were there for us through every decision we encountered. Getting married in a foreign country should feel quite stressful, but working with Martina we felt extremely calm and comfortable knowing our perfect day was in her hands. Aaron and I would like to thank all of you who worked to make our special day a fairytale. Everything was absolutely perfect and went off without a hitch, as we say in the States! The Red Hall in Florence is incredibly regal, and was the perfect location for our ceremony. Martina also could not have helped us pick a more perfect location for our reception. Alle Murate is a treasure in the heart of Florence and we were blessed with such a delicious, traditional Italian meal secluded from the restaurant in the private wine cellar. We would not have been able to execute our dream wedding as flawlessly as it was without the help of Martina and her team. We are incredibly grateful to you for your patience and expertise! It's incredible how many people have reached out to us, strangers included, in awe of our wedding and how spectacular it was. We owe it to you!